The fetid smell of Smithfield’s meat market hangs in the air. The sky rolls overhead continuing the day’s staccato pattern of torrential rain and searing heat. In the distance the faint peal of bells announces the passing of another hour in a city that has stood for nearly two millennia. As I draw closer to my quarry a sight in the distance sends a shiver like an icy spider down my vertebrae. Pink cowboy hats. No. Not here. Surely not. No one would sink so low. Step follows step. Barely thirty yards of pock marked pavement lay between me and my goal but the sound growing in my ears makes each coming yard seem like one towards the gates of hell. I seek to fortify myself by imagining the delights that may lie before me, a draught of hoppy amber nectar, but it is in vein. Any drink in this place will surely be from a poisoned chalice as it is destined to be consumed in the company of a Stag Do. Possibly a tad melodramatic. Stag/Hen do’s are a mixed bag and can be harmless as this lot turned out to be. Also given they’re fleeting and obviously bring in a much needed boost in trade I can’t blame landlords for welcoming them occasionally. 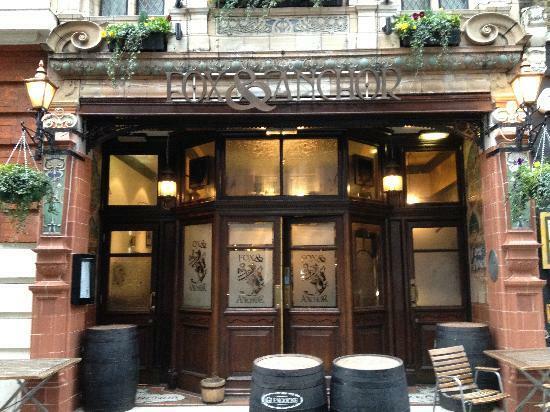 Sadly there were a fair few other things about The Fox and Anchor that also let it down. This sentence has never and will never be uttered. If a pub insists on having telly on when there’s no sport surely keep it on rolling news? A ticker tape of misery is always preferable to Hammonds smug grimace. Pub snacks are a must for me if somewhere is going to get me to stay for more than a single beverage. The Fox and Anchor has a dribble inducing smorgasbord of options at the end of the bar. I didn’t eat any of them though. After paying over four quid for a pint asking for another four and a half quid for a pork pie is frankly removing the urine. Food here does look great but it’s in the realms of Cutty Sark when pricing comes into it and doesn’t have the view or the prestige to back it up. After these cringing disappointments The Fox and Anchor looked like it could claw itself back from the abyss by having a strong beer choice. Simply put; it does. It serves them in pewter tankards too which is a nice touch. When I pointed out that my beer was off though (end of the barrel, bleugh) it took three staff and more arguing than I was really comfortable with to get it replaced. What did we like? It had the nicest toilets I’ve seen in a long time and had the papers. This looks and feels like it ought to be a great. But there is something dreadfully wrong about it that puts me off hugely. Tempted to say it’s down to personal taste but if you go I’m fairly convinced you’ll agree that The Fox and Anchor is currently missing the mark.